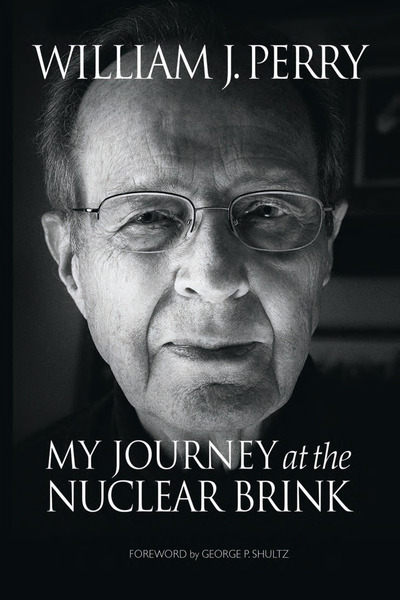 Dreams of a technocrat: Review of William Perry's "My Journey at the Nuclear Brink"
Technocrats have had a mixed record in guiding major policies of the United States government. Perhaps the most famous technocrat of the postwar years was Robert McNamara, the longest serving secretary of defense who worked for both John Kennedy and Lyndon Johnson. Before joining Kennedy’s cabinet McNamara was the president of Ford Motor Company, the first person from outside the Ford family to occupy that position. Before coming to Ford, McNamara had done statistical analysis of the bombing campaign over Japan during the Second World War. Working under the famously ruthless General Curtis LeMay, McNamara worked out the most efficient ways to destroy the maximum amount of Japanese war infrastructure. On March 9, 1945, this kind of analysis contributed to the virtual destruction of Tokyo through bombing and the deaths of a hundred thousand civilians in a firestorm. While McNamara later expressed some regrets about large-scale destruction of cities, he generally subscribed to LeMay’s philosophy. LeMay’s philosophy was simple: once a war has started, you need to end it as soon as possible, and if this involves killing large numbers of civilians, so be it. The Second World War was a transformational conflict in terms of applying the techniques of statistics and engineering to war problems. In many ways the war belonged to technocrats like McNamara and Vannevar Bush who was one of the leaders of the Manhattan Project. The success that these technocrats achieved through inventions like radar, the atomic bomb and the development of the computer were self-evident, so it was not surprising that scientists became a highly sought after voice in the corridors of power after the war. Some like Richard Feynman wanted nothing to do with weapons research after the war ended. Others like Robert Oppenheimer embraced this power. Unfortunately Oppenheimer’s naiveté combined with the beginnings of the Cold War generated paranoia and resulted in a disgraceful public hearing that stripped him of his security clearance. After McNamara was appointed to the position by Kennedy, he began a tight restructuring of the defense forces by adopting the same kinds of statistical research techniques that he had used at Ford. Some of these techniques go by the name of operations research. McNamara’s policies led to cost reduction and consolidation of weapons systems. He brought a much more scientific approach to thinking about defense problems. One of his important successes was to change official US nuclear posture from the massive retaliation adopted by the Eisenhower administration to a strategy of more proportionate response adopted by the Kennedy administration. At this point in time McNamara was playing the role of the good technocrat. Then Kennedy was assassinated and the Vietnam War started. Lyndon Johnson put pressure on McNamara and his other advisors to expand American military presence in Vietnam. To obey Johnson’s wishes, McNamara used the same techniques as he had before, but this time to increase the number of American troops and firepower in a remote country halfway around the world. Just like he had during the Second World War, he organized a series of bombing campaigns that laid waste not just to North Vietnamese military installations but to their dams and rice fields. Just like it had during the previous war, the bombing killed a large number of civilians without having a measurable impact on the morale or determination of Ho Chi Minh’s troops. The lessons of the Second World War should have told McNamara that bombing by itself couldn’t end a war. The man who had studied moral philosophy at Berkeley before he got ensnared by the trappings of power failed to realize that you cannot win over a nation through technology and military action. You can only do that by winning over the hearts and minds of its citizens and understanding their culture and history. Not just McNamara but most of Kennedy and Johnson’s other advisors also failed to understand this. They had reached the limits of technocratic problem solving. William Perry seems to have avoided many of the problems that beset technocrats like McNamara. Perry was secretary of defense under Bill Clinton. 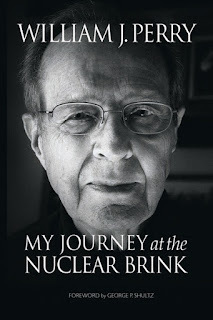 His memoir is titled “My Journey at the Nuclear Brink”. As the memoir makes clear, this journey is one the entire world shares. The book is essentially a brisk and personal ride through the journey but there is little historical detail that puts some of the stories in context; for this readers would have to look at some of the references cited at the back. Perry came from a bonafide technical background. After serving at the end of the war and seeing the destruction in Tokyo and Okinawa, he returned to college and obtained bachelors and graduate degrees in mathematics. He then took the then unusual step of going to California, at a time when Silicon Valley did not exist and the transistor had just been invented. Perry joined an electronics company called Sylvania whose products started getting traction with the defense department. By this time the Cold War was in full swing, and the Eisenhower and Kennedy administrations wanted to harness the full potential of science and technology in the fight against communism. To provide advice to the government, Eisenhower set up a president’s science advisory committee (PSAC) which included accomplished scientists like Hans Bethe and George Kistiakowsky, both of whom had held senior positions in the Manhattan project. One of the most important uses of technology was in reconnaissance of enemy planes and missiles. Perry’s company developed some of the first sensors for detecting radar signatures of Soviet ICBM’s and their transmitters. He also contributed to some of the first communication satellites and played an important role in deciphering the images of medium range nuclear missiles installed in Cuba during the Cuban Missile Crisis. Perry understood well the great contribution technology could make not just to offense but also to defense. He recognized early that electronic technology was moving from analog to digital with the invention of the integrated chip and decided to start his own company to exploit its potential. His new company built sophisticated systems for detecting enemy weapons. It was successful and ultimately employed more than a thousand people, making Perry a wealthy man. It was while heading this company that Perry was invited to serve in the administration of Jimmy Carter in the position of undersecretary of defense for research and development. He had to make a significant personal financial sacrifice in divesting himself of the shares of his and other companies in order to be eligible for government service. Perry’s background was ideal for this position, and it was in this capacity that he made what I think was his greatest contribution. At this point in history, the Soviet Union had achieved nuclear parity with the United States. They could achieve parity by building missiles called MIRVs which could house multiple nuclear warheads on one missile and target them independently against multiple cities. The introduction of MIRVs was not banned by the ABM treaty which Nixon had signed in the early 70s. Because of MIRV’s the Soviets could now field many more nuclear weapons than they could before. The US already possessed tens of thousands of nuclear weapons, most of them at hair trigger alert. Perry wisely recognized that the response to the Soviet buildup was not a blind increase in the US nuclear arsenal. Instead it was an increase not in nuclear but in conventional forces. Over the next few years Perry saw the development of some of the most important conventional weapons systems in the armamentarium. This included the Blackbird stealth fighter which had a very small radar signature as well as smart sensors and smart bombs which could target enemy installations with pinpoint accuracy. These weapons were very useful in the first Iraq War, fought two decades later. Today Perry’s contribution remains enduring. The strength of the US military’s conventional weapons is vast and this fact remains one of the best arguments for drastically reducing America’s nuclear weapons. When Ronald Reagan became president he adopted a much tougher stance against the Soviets. His famous ‘Evil Empire’ speech cast the Soviet Union in a fundamentally irreconcilable light while his ‘Star Wars’ speech promised the American people a system of ballistic missile defense against Soviet ICBMs. Both these announcements were deeply flawed. The Evil Empire speech was flawed from a political standpoint. The Star Wars speech was flawed from a technical standpoint. On the political side, the Soviets would only construe Reagan’s stand as an excuse to build more offensive weapons. On the technical side, it had been shown comprehensively that any defense system would be cheaply overwhelmed using decoys and countermeasures, and it would take only a fraction of the launched missiles to get through to cause terrible destruction. Standing on the outside Perry could not do much, but because of his years of experience in both weapons development and talking to leaders and scientists from other countries, he initiated what he called ‘Track 2 diplomacy’, that is diplomacy outside official channels. He established good relationships with Soviet and Chinese generals and politicians and made many trips to these two and other nations. Like others before and after him, Perry understood that some of the most important geopolitical problem solving happens at the personal level. This fact was especially driven home when Perry spent a lot of his time as secretary of defense advocating for better living conditions for American troops. In his second term Reagan completely reversed his stand and sought reconciliation with the Soviets. This change was driven partly by his own thinking about the catastrophic consequences of nuclear war and largely by the ascendancy of Mikhail Gorbachev. As Freeman Dyson has pointed out, it's worth noting that the largest arms reductions in history were carried out by supposedly hawkish right-wing Republicans. Reagan and George H W Bush and Gorbachev dismantled an entire class of nuclear weapons. Before that, Republican president Richard Nixon had unilaterally got rid of chemical and biological weapons. Republican presidents can do this when Democratic presidents cannot because they cannot be easily accused of being doves by their own party. I believe that even in the future it is Republicans rather than Democrats who stand the best chance of getting rid of nuclear weapons. Because people like William Perry have strengthened the conventional military forces of the US so well, the country can now afford to not need nuclear weapons for deterrence. When Bill Clinton became president Perry again stepped into the limelight. The Soviet Union was collapsing and it suddenly presented a problem of very serious magnitude. The former Soviet republics of Ukraine, Belarus and Kazakhstan suddenly found themselves with thousands of nuclear weapons without centralized Soviet authority. Many of these weapons were unsecured and loose, and rogue terrorists or states could have easily obtained access to them. Two American senators from opposing parties, Sam Nunn and Richard Lugar, proposed a plan through which the US could help the Soviets dismantle their weapons and buy the nuclear material from them. Nunn and Lugar worked with Perry and weapons expert Ash Carter to secure this material from thousands of warheads, blending it down from weapons-grade to reactor-grade. In return the US destroyed several of its own missile silos and weapons. In one of the most poignant facts of history, a sizable fraction of US electricity today comes from uranium and plutonium from Russian nuclear bombs which had been targeted on New York, Washington DC and San Francisco. The Nunn-Lugar program of denuclearizing Russia is one of the greatest and most important bipartisan triumphs in American history. It has undoubtedly made the world a safer place, and Nunn and Lugar perhaps along with Perry and his Russian counterparts surely deserve a Nobel Peace Prize for their efforts. When Perry became secretary of defense under Clinton, much of his time was occupied with North Korea, an issue that continues to confront the world today. North Korea has been fighting an extended war with the United States and South Korea since the 1950s ever since the Korean War ended only in a truce. In the 90s the North Koreans announced that they would start reprocessing plutonium from their nuclear reactors. This would be the first step toward quickly building a plutonium bomb. Both South Korea and the US had serious concerns about this. Perry engaged in a series of diplomatic talks, some involving former president Jimmy Carter, at the end of which the North Koreans decided to forgo reprocessing in return for fuel to help their impoverished country. Perry’s accounts of North Korea contains amusing facts, such as the New York Philharmonic organizing a concert in Pyongyang and Perry entertaining a top North Korean general in Silicon Valley. Today the problem of North Korea seems serious, but it’s worth remembering that someone like Kim Jong Un who relishes such total control over his people would be reluctant to lose that control willingly by initiating a nuclear war in which his country would be completely destroyed. The greatest problem, however, was Russia and today many of Perry’s thoughts and actions from the nineties about Russia sound prescient. After the Cold War ended, for some time US-Russia relations were at an all time high. The main bone of contention was NATO. Many former Soviet-controlled countries like Poland and Ukraine wanted to join NATO to enjoy the same security that other NATO members had. Perry was in favor of letting these countries join NATO, but he wisely understood that too rapid an assimilation of too many nations into NATO would make Russia uneasy and start seeing the US as a threat again. He proposed asking these nations to join NATO along a leisurely timeline. Against his opinion Clinton provided immediate support for NATO membership for these countries. A few years later, after George W Bush became president, partly because of US actions and partly because of Russia’s, Perry’s fears turned out to be true. The US withdrew from the ABM treaty because they wanted to put ballistic missile defense in Eastern Europe, ostensibly against Iranian ICBMs. Notwithstanding the technical flaws still inherent in missile defense, the Russians unsurprisingly questioned why the US needed this defense against a country which was still years away from building ICBMs and construed it as a bulwark against Russia. The Russians therefore started working on their own missile defense and a MIRV missile as well as new tactical nuclear weapons themselves. Unlike high-yield strategic weapons which can wipe out cities, low-yield tactical weapons ironically increase the probability of nuclear war since they can be used locally on battlefields. When Obama became president of the United States and Medvedev became president of Russia, there was a small window of hope for reduction of nuclear weapons on both sides, but the election of Putin and Trump has dimmed the chances of reaching an agreement in the near future. North Korea has also gone nuclear by conducting a nuclear test in 2006. Perry’s greatest concern throughout his career has been to reduce the risk of nuclear war. He thinks that nuclear war is quite low on the list of public concerns, and this is a strange fact indeed. Even a small nuclear bomb used in a major city would lead to hundreds of thousands of deaths and severe social and economic disruption. It would be a catastrophe unlike any we have faced until now and would make 9/11 look like child’s play. With so many countries having nuclear weapons, even the small risk of a rogue terrorist stealing a weapon is greatly amplified by the horrific consequences. If nuclear weapons are such a serious problem, why are they largely absent from the public consciousness? It seems that nuclear weapons don’t enter the public consciousness because of a confluence of factors. Firstly, most of us take deterrence for granted. We think that as long as most countries have nuclear weapons, mutually assured destruction and rationality would keep us safe. But this is little more than a false sense of security; mutually assured destruction is not a rational strategy, it is simply an unfortunate reality that emerged from our collective actions. We are very lucky that no nuclear attack has taken place after Nagasaki, but there have been scores of nuclear accidents that almost led to bombs being exploded, some near American cities. The book “Command and Control” by Eric Schlosser describes dozens of such frightening accidents. Just a few years ago there was an incident in which American military planes flew from North Dakota to Louisiana without realizing that there were nuclear bombs onboard. In addition, even during events like the Cuban Missile Crisis, the world came very close to nuclear war, and a slight misunderstanding could have triggered a nuclear launch: in fact it is now widely acknowledged that dumb luck played as big a role in the crisis not escalating as any rational action. There are also false alarms, one of which Perry recollects: an accidental playing of a training exercise tape led a general to the erroneous conclusion that two hundred nuclear tipped missiles were heading from the Soviet Union toward the US. Fortunately it was discovered that this was a false alarm in seconds, but if it had not, according to protocol American ICBMs would have been launched against Russia within minutes, and the Russians would have retaliated massively. The problem with nuclear weapons is that the window of prevention is very small, and therefore accidents are quite likely. The reason the American public does not fear nuclear weapons as much as it should is because it sees that the red line has never been crossed and it believes that the line will never be crossed, but it does not see how close we already came to crossing it. Secondly, the media is much more concerned with reporting on the latest political or celebrity scandal and important but much less precipitous problems like climate change rather than on nuclear weapons. Of the two major problems confronting humanity – nuclear war and climate change – I believe nuclear war is the more urgent. The impacts of climate change are mixed, longer term and more unpredictable. The impacts of nuclear war are unambiguously bad, immediate and more predictable. Unfortunately climate change especially has been an obsession with both the media and the public in spite of its uncertainties, whereas the certain consequences of a nuclear attack have been ignored by both. The supposed dangers of climate change have been widely publicized by self-proclaimed prophets like Al Gore, but there are no such prophets publicizing the dangers of nuclear weapons. For one reason or another, both the public and the media consider nuclear weapons to be a low priority because no nuclear accident has happened during the last fifty years, but they keep on ignoring the very high costs of even a low risk attack. If nuclear weapons received the kind of massive publicity that global warming has received, there is no doubt that they too would loom large on everyone’s mind. Changing attitudes is hard, although Perry certainly has tried. Nuclear weapons were born of science, but their solution is not technical. With his colleagues Sam Nunn, George Schultz, Henry Kissinger and Sidney Drell, Perry started an initiative whose goal is the reduction of nuclear weapons through both official and unofficial diplomacy. All four of these people have had deep experience with both nuclear weapons and diplomacy. Encouraging economic and trade relationships between traditional rivals like India and Pakistan for instance would be a key strategy in reducing the risk of nuclear conflict between such nations: one reason why an actual war between the US and China is highly unlikely is because both countries depend heavily on each other for economic benefits. The key objective in caging the nuclear genie is to remind nations of their common security and the fact that individual lives are precious on all sides. During the Cold War, it was only when the US and the Soviet Union recognized that even a “win” for one country in a nuclear war would involve large-scale destruction of both countries did they finally realize how important it was to cooperate. Finally, Perry has made it his life’s goal to educate young people about these dangers, both through his classes at Stanford University as well as through his website. The future is in these young people’s hands, and as much of the world including Russia seems to be reverting to the old ways of thinking, it’s young people whose minds are unspoiled by preconceived notions who give us our best chance of ridding the world of the nuclear menace.